Use this fiddle to color your own lyrics! In my previous blogpost I described a program I wrote that colorizes the phonetic patterns in song lyrics. I included a few examples that demonstrated what the program can do, but I did not give others the opportunity to play with its functionality. After a year and change, I decided to implement the changes necessary to expose this nifty program to the public. The result is above, enjoy! If you’re looking for implementation details related to the colorization of lyrics, see my previous blogpost. Don’t try to port an application to another environment without stepping into that environment. Don’t fear the Makefile, but respect the Makefile. Portable programs often require nontrivial additional work. At the time of writing, AWS Lambda did not support Python3. This recently changed. AWS Lambda also only supports a few specific runtimes for executing the application: Python2.7, Java8, Node, and .NET. In my application’s case, I was using a mix of bash, Python3 and an application fetched from APT (espeak). Luckily, you can call the system via shell script from the limited selection of runtimes, and Python3 just so happens to be available. So essentially, Python3 is technically supported with this workaround. I believe other scripting languages like Ruby are also available using this hack. AWS Lambda really wants you to use JSON. It’s understandable; I’m sure most applications using Lambda are talking to other applications. However, I wanted: input:text, output:html. This blogpost was very useful for returning HTML from Lambda + API Gateway. In order to accept plain text as an input, I used the Integration Request template “Method Request passthrough” which maps the body of the request to a JSON element “body-json”. The Lambda application I wrote reads in this JSON element. You cannot avoid the JSON in AWS Lambda (easily). I’m glad I decided to finish this project. This experience gave me the opportunity to learn about the intricacies of serverless deployments and how to make them work. I will certainly consider using serverless architecture providers like AWS Lambda in the future. “Lose Yourself” by Eminem, phonetically colored. This blog post explores synesthesia as it relates to music and lyrics. I wrote a program that colorizes song lyrics to expose the complex rhyming patterns used by talented lyricists. The following is the lyrics to Eminem’s “Lose Yourself” paired with its International Phonetic Alphabet notation. I recommend listening to the song first or while scrolling through this frame to fully experience the patterns. Synesethesia is really weird. To quote Wikipedia, synesthesia is “a neurological phenomenon in which stimulation of one sensory or cognitive pathway leads to automatic, involuntary experiences in a second sensory or cognitive pathway.” Some people see colors when they see letters or numbers, some see numbers in two or three dimensional space, and some even taste guacamole when they hear the word “Chipotle” (ok, maybe that’s everyone). I’ve always been fascinated by synesthesia and its possible practical applications. 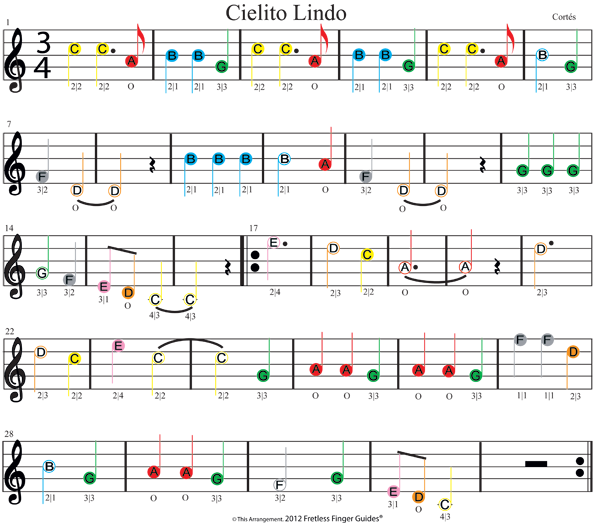 If numbers were innately colored, not just by individual digits, what kind of patterns would emerge? What if words were colored? Would it be easier to read? A form of synesthesia you’re experiencing right now is the association of these words with sounds in your mind… unless you’re mute. Let’s go further. Some forms of synesthesia combine audible experiences like music with colors. Could lyrics in music invoke color? I’m surprised this isn’t more common. The most useful aspect of this coloring would be for notes that are far above or below the clef. I’d like to see something like this without the letters on a more complex piece. Another project for another day. This fantastic video on rhyming inspired me to write this program, and it made me wonder: What if each phonetic sound had a unique color and were superimposed over the lyrics. Wouldn’t it be cool to see the lyrical detail exposed in color? So that’s what I did. I made a tool that colorizes the most common phonetic sounds in song lyrics and converts them to an HTML page for people to view. From here I’ll go into the technical details of how I wrote this program. This funnels the lyrics into eSpeak and outputs the words in IPA. The -q operator prevents eSpeak from audibly speaking the lyrics. eSpeak is no Eminem. eSpeak has some limitations. eSpeak implies an interesting, possibly European, accent and will never be able to capture slant rhymes. Some words may be translated into a phonetic sound that we don’t really use in America, but it’s close enough. The next challenge was converting the newly phonetic lyrics into some sort of meaningful color scheme. First, I needed a method of coloring. I looked into libraries that converted text to an image like ImagingBook python library, but I needed something faster. Then I remembered that the Linux terminal supports colors! Luckily, someone has already written a python library for formatting terminal output with color, termcolor. Next, I need to figure out how to color these lyrics. I considered searching for rhyme patterns, but it became too complex. I decided to give each IPA symbol its own color and the individual colors would work together to expose these rhyme patterns. However, there are a limited number of colorings available to the terminal (6 colors and 6 color backgrounds). This limitation was unfortunate, but I think it helps keep the final product from becoming too cluttered. To cope with this limitation, I decided that vowel sounds were the most important for coloring rhyming patterns. I filtered out everything but the vowel sounds and vowel modifiers. IPA has a number of modifiers that change the way a character sounds. The most common is ‘ː’ which indicates a long vowel. I decided to pair the modifier with the associated vowel and treat it as a single unique sound character as well. For example, ‘uː’ represents the long ‘u’ sound. Synesthesia is a cool concept/phenomenon that can enhance our perception of reality. I think mixing senses helps us grok things more quickly, and there are plenty of other ways we can combine senses for our collective benefit. This tool is my first stab at it, but maybe I’ll make something better in the future. I have an Oculus Rift DK2, which I noticed has a distinct lack of smell-o-vision. So this is the part where I link to the code on Github, right? The code is pretty nasty right now, so I think I’ll take some time to clean it up before sharing. However, if you have a sick rhyme that needs coloring, let me know. I promise my next blog post won’t be about music! Procedurally Generated Content is a method of creating content using algorithms. It originally served to save space for video games on systems with limited memory, but game developers soon discovered that they could create near infinite unique experiences by procedurally generating content with the power of Random Number Generators. Game devs continue to improve techniques of random content generation. Random numbers allow them to multiply the creative potential of their works. One of the most popular examples of random numbers powering content generation is Minecraft. 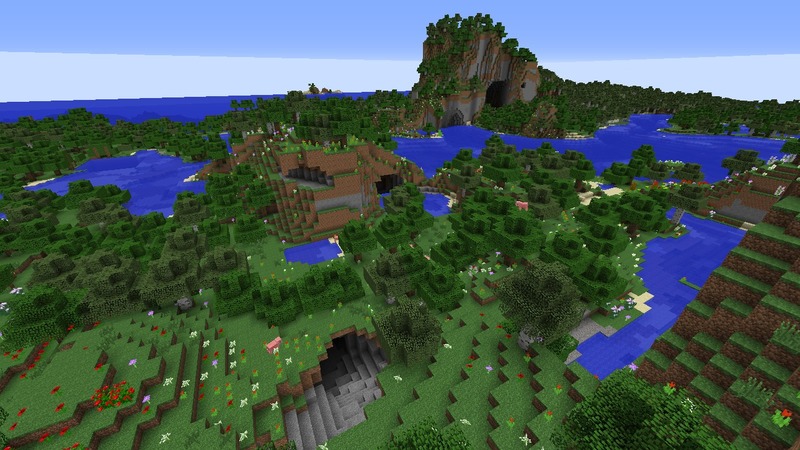 Minecraft creates an entirely new world when a player starts a new game. While algorithms guide the creation of their world, each and every player’s world is unique. Minecraft systematically generates a wonderful hodgepodge of forests, oceans, deserts, tundra, caves, enemies, and treasures that are unique to each and every player. This trend has taken off and provided humanity with some of the world’s best gaming experiences. I continue to enjoy games that use this type of content creation. In fact, it may be my favorite genre of games. I suppose it’s the result of my obsession that I began to think of other mediums where we could use random numbers to procedurally generate content. The first thing that came to mind was music. I’m not going to tell you that I’m the first person to think of this concept. However, I want to present to you my attempt at outsourcing musical creativity to the power of computers and random numbers. As a quick musical autobiography, I played piano for 2 years starting in 2nd grade and played trumpet for 4 years from 5th to 8th grade. In middle school I played in the jazz band, and our instructor introduced us to a beautiful thing, improvisation. While learning to improvise, students are given a set of rules: play at X beats per minute and use these seven specific notes (a key) in any octave. Given these rules, it isn’t very hard to do some basic improvisation with some minor proficiency in scales. By mixing up the rhythm and the seven notes given, improvisation almost comes naturally. Here’s a fun example of the four chords in action. There’s no denying its influence. So now I’ve gone over a few concepts: Random content generation, improvisation, and the pop mega chord progression of your dreams/nightmares. Based on these concepts, let’s make some really naive assumptions. Random content generation is awesome. Improvisation is easy when given a beat and a key. Music is easy to make in I-V-vi-IV. Given these assumptions, anyone can make a hit pop record by randomly playing notes in a key while playing the pop chord progression in the background. Even a computer. I ran with this idea and created the music generator at the top of the page. After listening for a moment, it sounds like a chaotic pop ballad, hence the name! Now I’ll go over the technical details of the project. If you’re not technical and/or familiar with music theory, this section may get a little hairy. Given this equation, I was able to generate 7 note scales with a base key. Scales follow another formula to determine each note in the scale. There are 2 full steps followed by a half step, 3 full steps, and finally one half step. If this sounds completely foreign, take a look at a piano keyboard. Each directly adjacent key is a half step, so if there is a black key inbetween, the two keys are a whole step apart. The C scale is a great example because it uses no black keys. Here’s the for loop I use to generate an array that I use to find the correct frequencies to play in a scale. The base variable is derived from a set of constant frequencies for each key and multiplied by the desired octave. The range is the number of notes in the scale we want to generate. You can’t make music without a beat. For simplicity, I use four beats per measure and change the chord on each measure. I originally implemented this music generator with 4 quarter notes per measure, but I knew that real improvisation mixes up the duration of notes along with their frequencies. Currently the program randomly chooses to change the note length minimumNote/quarterNote * 100 % of the time it progresses the length of a minimum note. The default setting for the minimum note is an eighth note, so it changes notes 50% of the time every eighth note. This isn’t the best variety, but I think it gives just enough to make it interesting without going off the rails. The random note length and time signature implementation certainly have room for improvement. Given the scale and the range, the program selects a new, random note in that range each time the program decides to change note length. This has the added benefit of further randomizing note length given the chance that the same note is played. Everything is based on an integer time and the minimum note. If you want to simplify the logic, imagine qtrNote == minNote. Through liberal use of the modulus function, we determine when to change chords and notes. The chords are changed every (predefined) 4 quarter notesPerMeasure. The chord integer runs through the 2D array we defined earlier to play the correct chord each measure by assigning the oscillators the correct frequency from the notes array we defined as our scale. The melody randomly decides to change notes at a rate dependent on the shortest note possible as discussed above. Then the function decides which note to play within the scale and range and sets the oscillator’s value to that frequency. Play it for more than 5 seconds. I can’t say that it will sound amazing to you, but it will be unique to you. This shouldn’t be too hard to implement based on how the code is structured, but it isn’t there today. I want to add a “solo” button that temporarily lowers the minimum note to a sixteenth note. Harmony? Unlikely given the current limits of AudioContext.